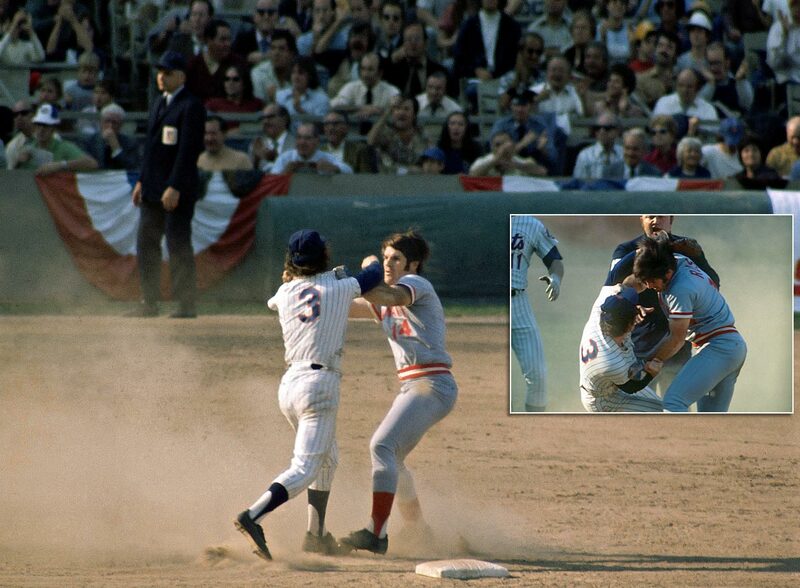 The Mets were routing the Reds 9-2 in Game 3 of the NLCS when Pete Rose slid hard into Mets shortstop Bud Harrelson at second base to try to break up a double play. 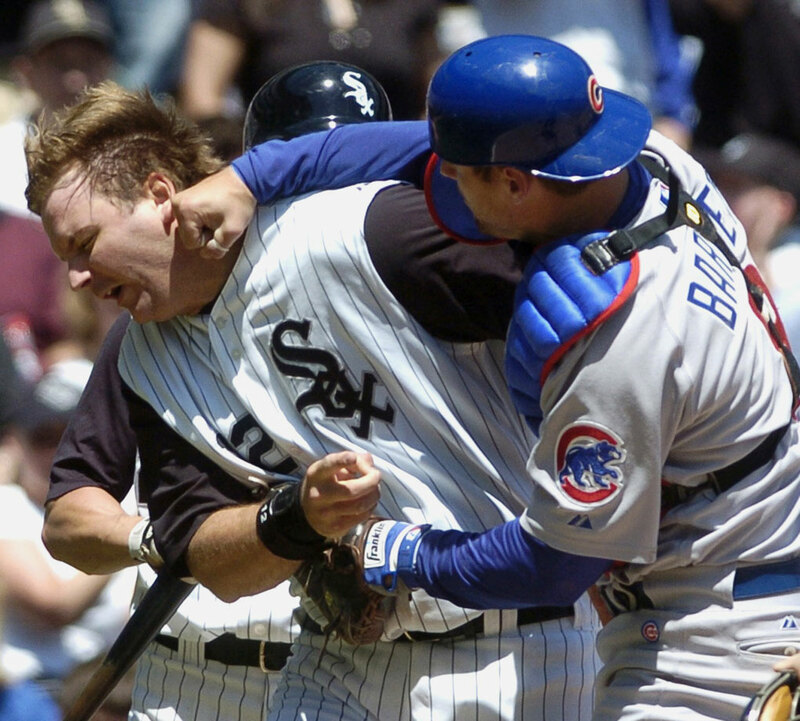 Rose was upset about comments Harrelson had made in the press and shoved Harrelson, who swung his elbow. Fists started flying as both benches emptied. Pedro Borbon of the Reds and Buzz Capra of the Mets also went mano a mano, with Borbon ending up with the wrong cap — a Mets cap — on his head. When he realized what he had done, he bit a chunk out of it. 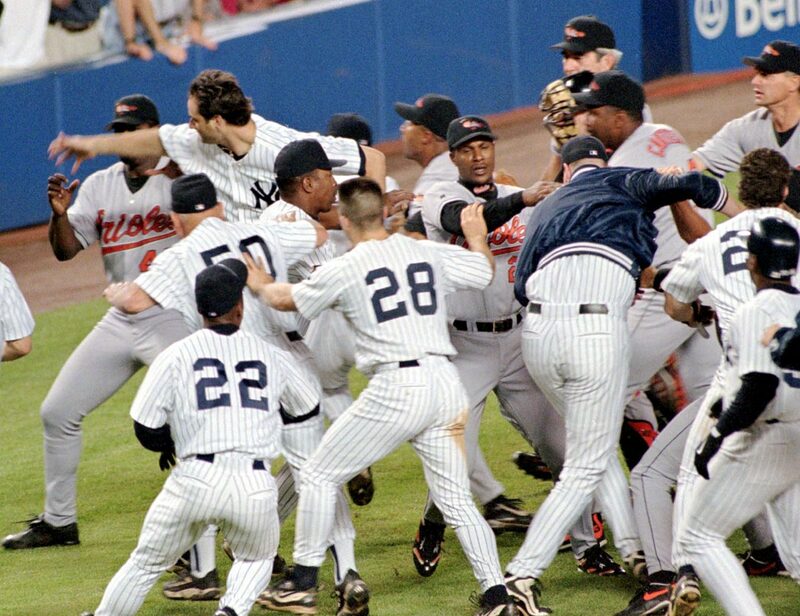 By the time the Orioles' Mike Mussina hit Bill Hasselman in the shoulder with a high fastball in the seventh inning, tempers in this game were already running hot. 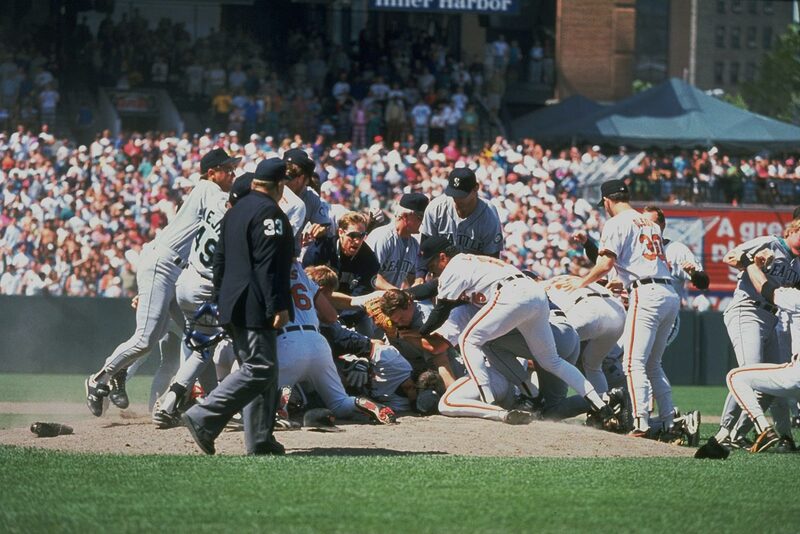 Once plunked, Hasselman charged Mussina, and amid the ensuing 20-minute scuffle, Bosio re-fractured his left collarbone, an injury from which he had just returned after missing a month. He missed another 19 days and served a five-game suspension upon returning, while six other players drew suspensions of three to five games as well. 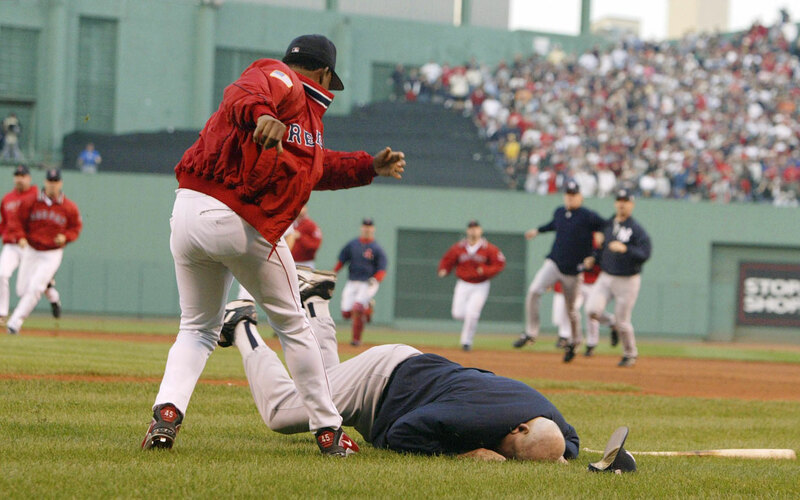 Hasselman received only a three-gamer, but Mussina wasn't disciplined even though Piniella claimed that an Oriole told him that the plunking had been ordered. 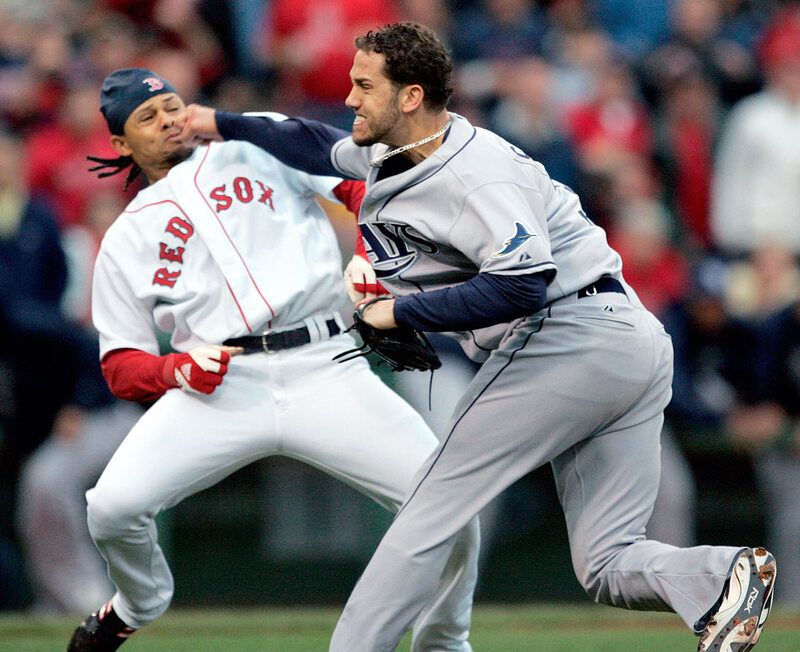 The ongoing feud between the Rays and Red Sox continued at Fenway Park when Tampa Bay's James Shields hit Boston's Coco Crisp in retaliation for Crisp's rough slide into a Tampa Bay player the previous night. 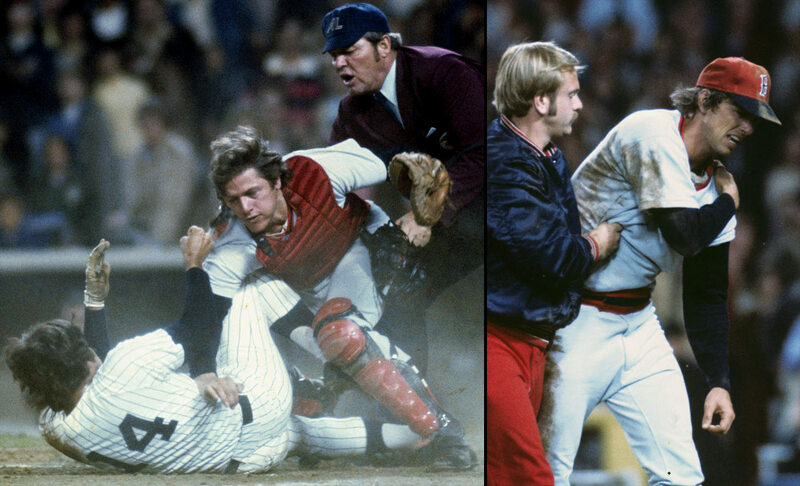 Crisp charged the mound, and both players threw roundhouse punches that failed to do any damage. 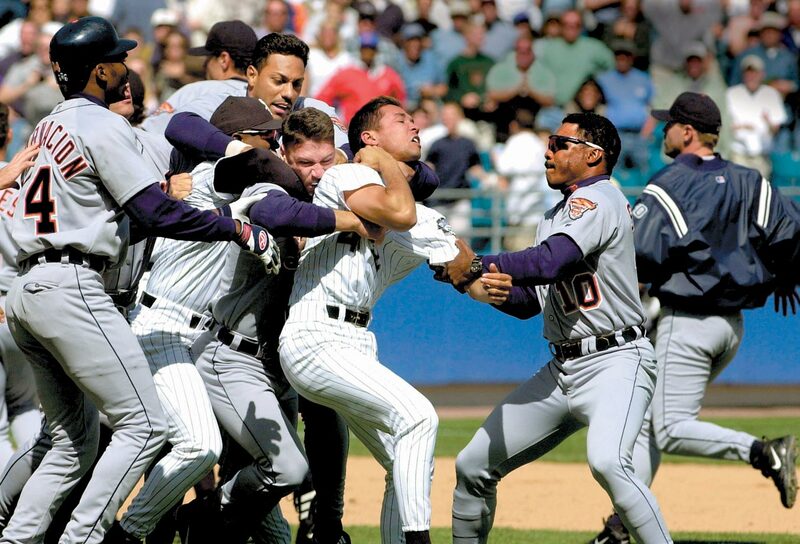 A bench-clearing brawl, resulting in three ejections, followed. 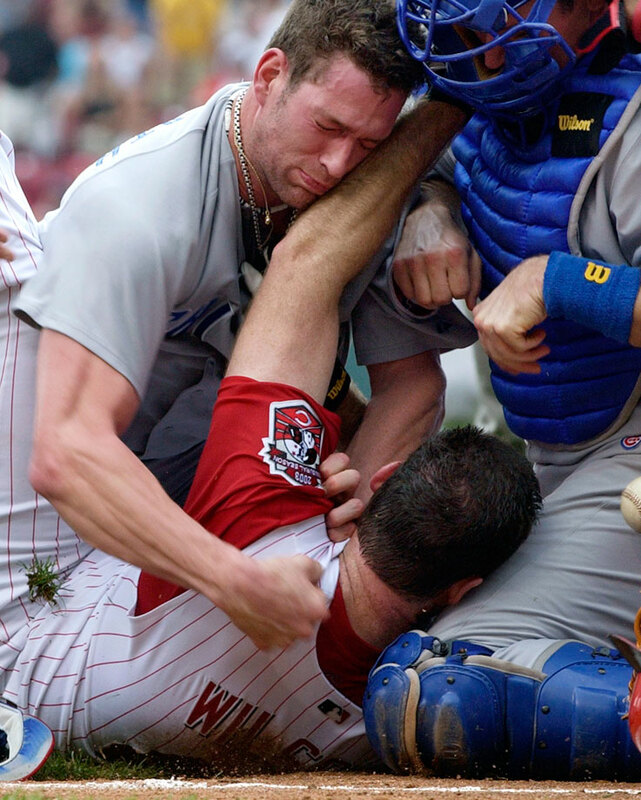 This exhibit of vigilante justice was on display in San Diego, when a fastball from the Dodgers' Zack Greinke veered inside and hit the Padres' Carlos Quentin on the left arm. 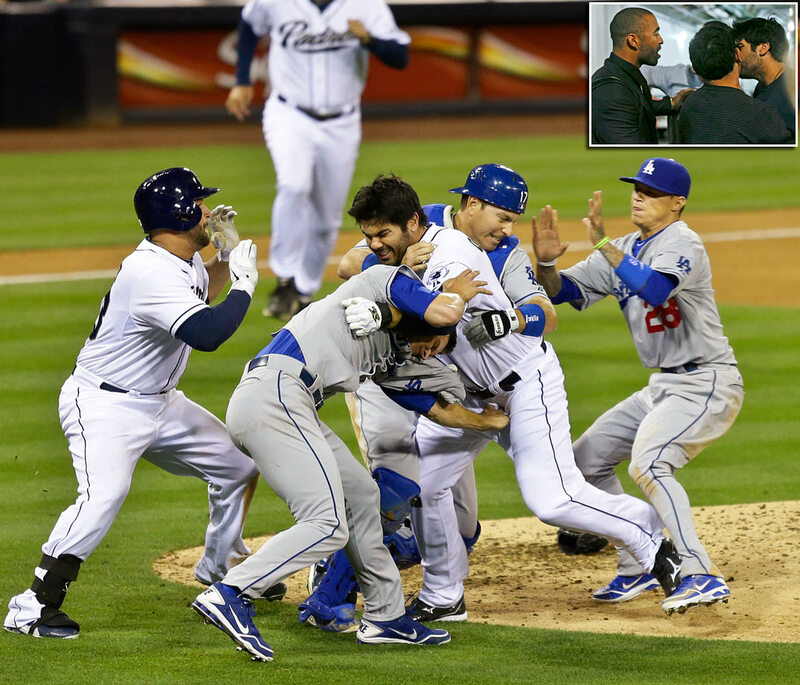 A moment later, Quentin charged the mound, and soon both benches emptied in a brawl. Greinke suffered a broken collarbone and was out over a month. After the game, Matt Kemp confronted Quentin in a tunnel under the stadium (inset) before Padres pitcher Clayton Richard separated them. 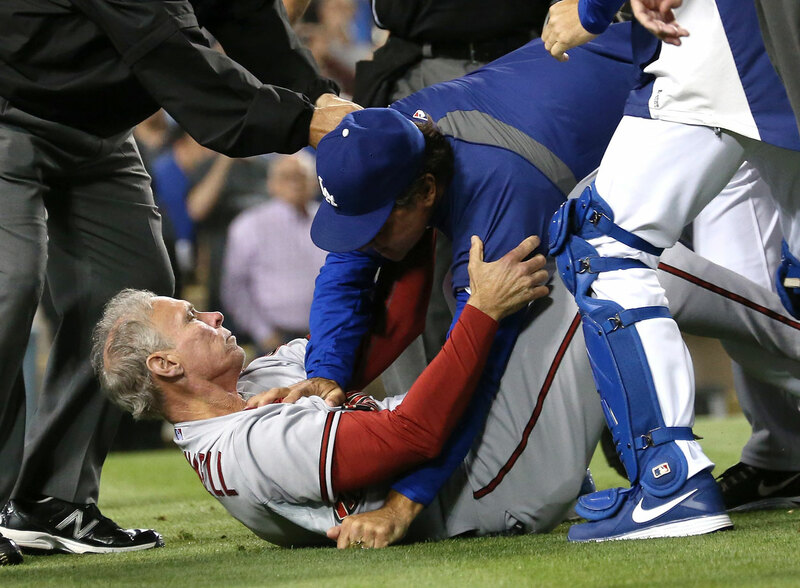 The Dodgers and Diamondbacks were involved in a heated brawl that involved players and coaches, including Don Mattingly taking down Alan Trammell. There were six ejections, stemming from a night in which Arizona's Ian Kennedy hit rookie Yasiel Puig in the face with a pitch and hit starter Zack Greinke with another high pitch. Carlos Gomez's penchant for admiring his home runs has been known to rub opponents the wrong way. 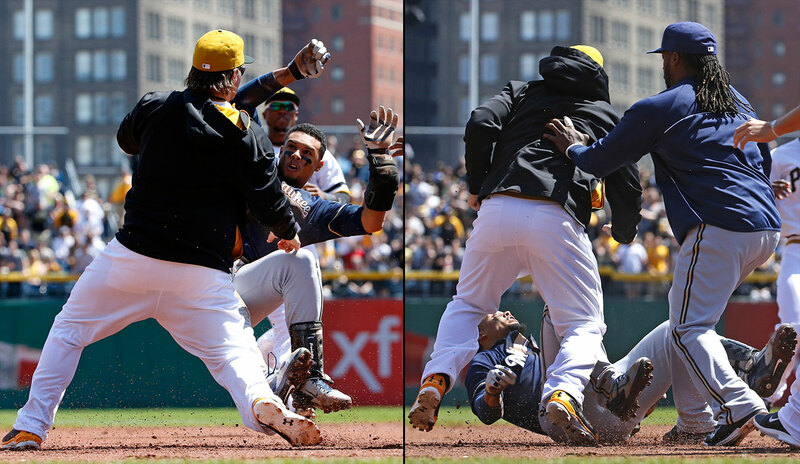 The Pirates took umbrage at his reaction to a ball that the Brewers centerfielder thought he had hit out, but did not, and his response triggered a bench-clearing brawl. Gomez threw punches at Pittsburgh's Travis Snider, then sparred with Russell Martin; both Pirates had come off the bench to join the scrum. 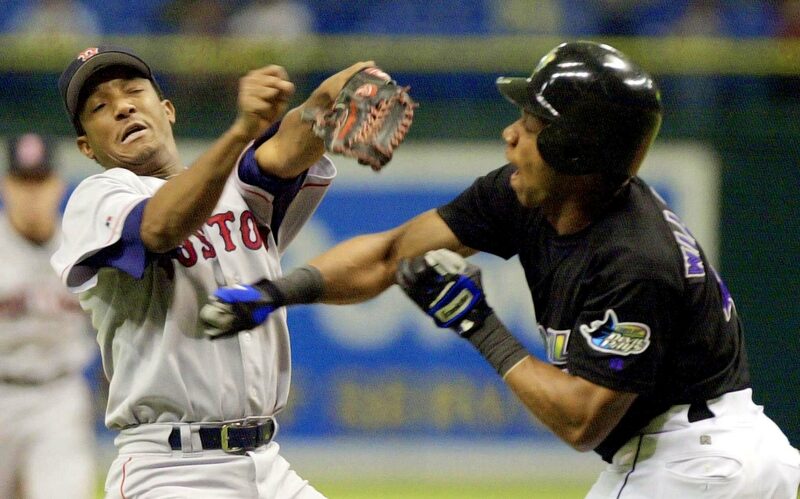 Gomez broke away and then Snider pushed him down before being tackled by Rickie Weeks and punched by Martin Maldonado. After a delay of several minutes, Gomez, Snider and Brewers bench coach Jerry Narron were all ejected, while Cole remained in the game. Tempers flared when Yordano Ventura fielded a ground ball from Adam Eaton in the bottom of the seventh inning and appeared to mouth profanities at him as Eaton jogged down the first base line. 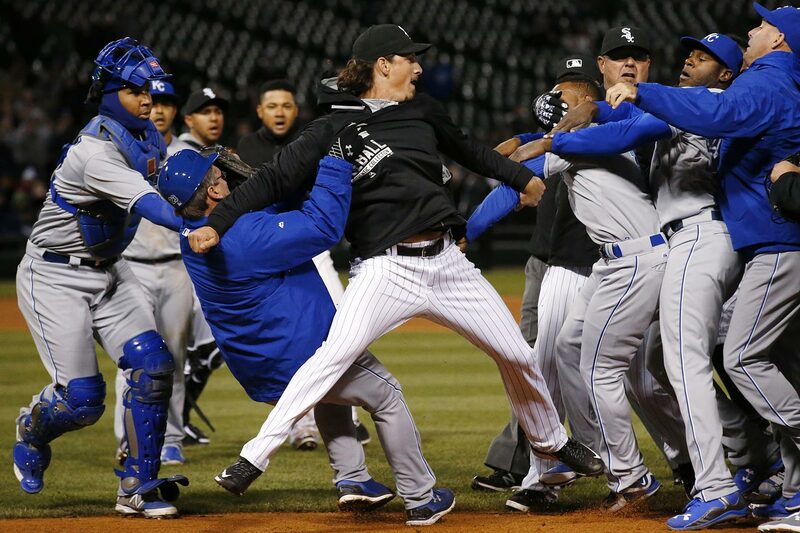 Later on in the ensuing scrum, Lorenzo Cain and Jeff Samardzija fought. Both players were ejected, as were Ventura, the Royals' Edinson Volquez and White Sox pitcher Chris Sale, who was repeatedly restrained by both Royals staff members and his own teammates. The A's and Royals were involved in a benches-clearing altercation of their own on April 17 after Oakland's Brett Lawrie slid hard into Royals second baseman Alcides Escobar, which led to several plunkings and two more bench-clearings in the final two games of the weekend series. 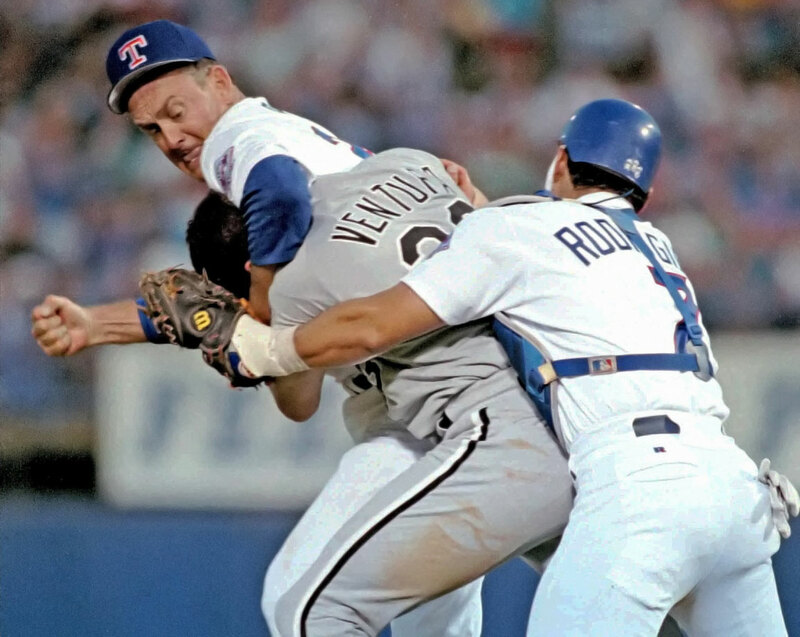 Sunday afternoon was apparently alright for fighting in Texas, as the Rangers and Blue Jays got into a benches-clearing brawl in the eighth inning of their series finale, a 7–6 win for the Rangers. The donnybrook, triggered by a hard, overaggressive slide into second base by Jose Bautista, was a true scrap, featuring Texas second baseman Rougned Odor landing a solid right cross on Bautista’s face and ejections galore—and the promise of some serious suspensions in the aftermath. But the roots of Sunday’s dustup likely go back to last October, when Bautista bat flipped his way into the Rangers’ ire. 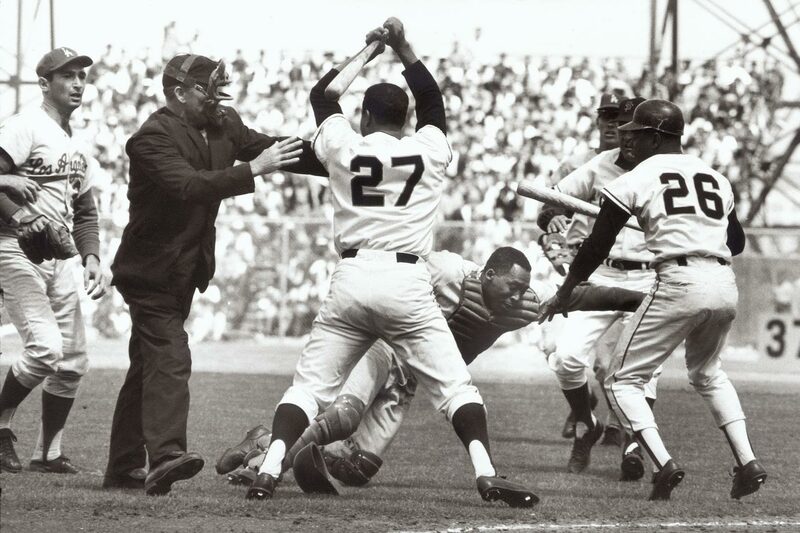 Now that you've had a few days to process the bench-clearing brawl between the Royals and White Sox, it's time to take a look at the above gallery of the most notorious fights in baseball history (click here for full-size gallery), leading with that time Juan Marichal used his bat as a weapon during a 1965 Giants-Dodgers brawl. Congrats to Collin Burns of Doylestown, Pa., who broke the world record for fastest time restoring a 3x3x3 Rubik's Cube, solving it in just 5.25 seconds. Burns officially becomes the second-best citizen of Doylestown. Number one is Samatha Hoopes, of course. Move over, Paul Pierce. My new favorite Kansas alumni is 89-year-old Bryan Sperry, who scored during the school's annual flag football game for lettermen. It's one of the best videos I've seen all year. Bobby from San Antonio wrote it to request I make British model Lucy Mecklenburgh LLOD. She earns today's honors (click here for full-size gallery). It's been nearly two weeks since I mentioned Johnny Manziel in Hot Clicks, a streak that is now over with this tidbit that he didn't leave a tip while dining at an Ohio golf club. Or maybe he left a cash tip. Who knows? Mandatory.com has its annual player mashups piece, which is a must-read for no other reason than this Rocky/Drago = Zaza Pachulia combo. 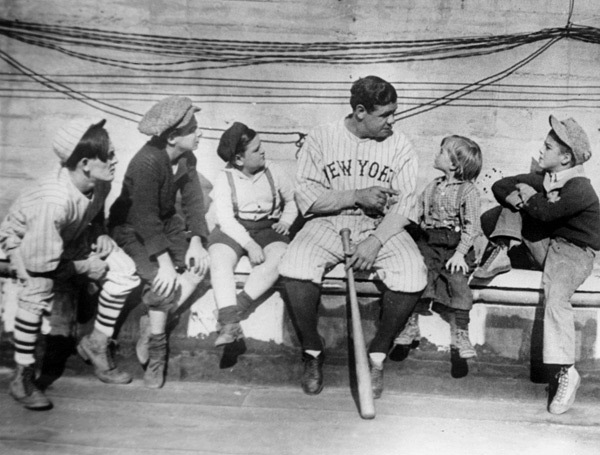 We have a great rare photos gallery to honor the Sultan of Swat. I don't post lacrosse content very often but this caught my eye ... Bruce Jenner Wheaties boxes are a hot item on eBay ... Jordan Spieth is on the Mavs bandwagon after receiving a jersey from Mark Cuban ... Selfie sticks have been officially banned from Wimbledon ... Still not sure how John Wall got away with this travel ... Bartolo Colon could really help the Jets this season ... Bridge is now considered an actual sport because the brain is a muscle ... Charles Barkley thinks J.R. Smith deserves a 10-game suspension for his cheap shot on Jae Crowder ... Vote for the 2015 sports media awards ... Brook Lopez has some concerns about time travel. Calgary officially has Flames fever. Dire Straits performs its hit at an April 1996 concert in London.